Desertion Trio joined us at newly-licensed Trans-Pecos this past Friday to celebrate the release of their new album, Midtown Tilt, having done the same in their hometown of Philadelphia the night before. The album picks up in many ways where their excellent 2016 effort, Desertion, left off, oscillating between focused riffage and freeform jazz improv. This set showed off not only bandleader Nick Millevoi’s ample guitar skills, but gave broad berth to guest keyboardist Jamie Saft, who appears on both of the band’s albums, adding tremendous depth in the process. Of course, the focus of this one-hour sessions was on Midtown Tilt, including an outstanding rendition of “Jai Alai Noon” that gave Saft ample room to run., while set closer “Numbers Maker” coalesced into an extended freakout before tapering off into its final minutes. For those of us who’d seen the band before, there was much to love about this version of “Desertion and Arsonist’s Match,” which departed from earlier, Saft-less renditions we’ve featured but kept the song’s essential nature as a palette for extended interaction. As we’ve pointed out before, all of these fine musicians contribute to the music world in so many ways, so it is a special pleasure to see them come together here in New York. 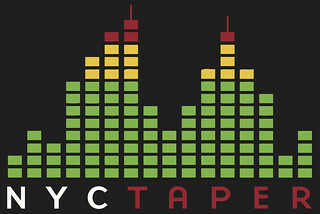 Check out Midtown Tilt, which is available directly from the band now. I recorded this set with Schoeps MK22 microphones at the stage lip, together with a soundboard feed. The sound quality is excellent. Enjoy! PLEASE SUPPORT Desertion Trio – visit their bandcamp page. For the past decade, Tompkins Square Records has pursued the dual missions of enlightening listeners about the current state of folk and guitar music, as well as unearthing underappreciated classics, such as John Hulburt’s Opus III, compilations of gospel songs, and Harry Taussig’s Fate Is Only Once. But on the first side of that slate — current artists — is where Tompkins Square has stood out the most, offering up records by Daniel Bachman, Shawn David McMillen, and last year’s Grammy-nominated set of music from respected folk singer Alice Gerrard. 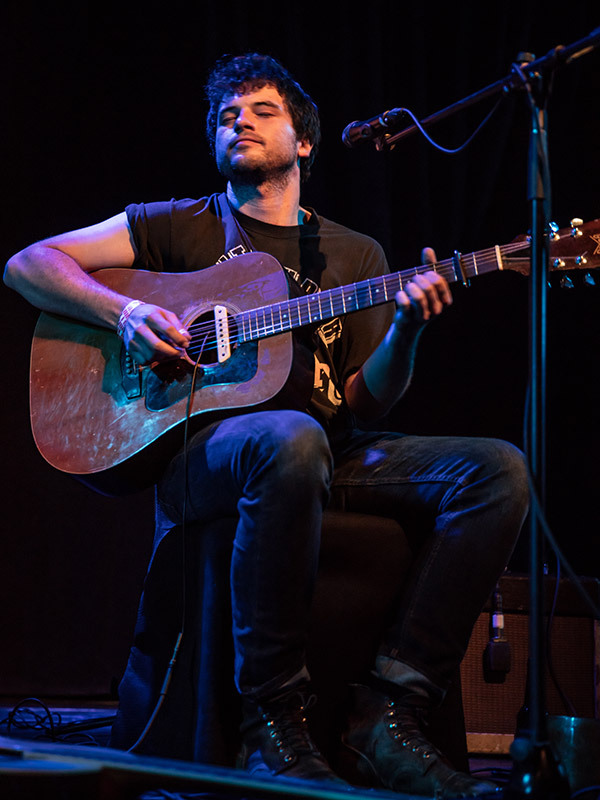 The biggest single breakout, though, might be Ryley Walker, of Chicago, whose debut album the label released back in 2014. From there, things moved fast, with Walker blowing our minds at a full-band appearance at Hopscotch, releasing his second album, Primrose Green, in 2015 (and a live album with Bill MacKay in August), and ending up on the roster of, among others, the Pitchfork Music Festival, Levitation, and Wilco’s Solid Sound Festival. As followers of this site know, we’ve seen him a slew of times since that Hopscotch show, each revealing new songs and new dimensions of his style. Fitting, then, that Ryley and his band would headline Tompkins Square’s tenth-anniversary celebration, at the top of a bill that also featured living legend Michael Chapman and the rediscovered D.C. folk musician Bob Brown, playing his first show in 30 years. Ryley said at the outset that he and his band didn’t deserve to be headlining over such company, and even if that wasn’t necessarily true, they certainly were the young guns among their peers. What followed that introduction was a sprawling, hour-plus set consisting of just four songs, all of them non-album material, two of them brand new to us. The band began with “The Roundabout,” a fitting metaphor for a song about possibilities that can just as easily turn into inertia. After that came the night’s sprawling centerpiece, “Sullen Mind,” which we first heard at Le Poisson Rouge back in June. This time, the song became a 25-minute showcase for the band and Ryley’s talents, the natural interplay among them obvious they grinned visibly at the transitions. “Funny Thing She Said” continued in that vein, giving sax man Levon Henry a showcase for his talents before Ryley even got to the first verse. This and “Sullen Mind” underscore how far Walker has come since even that 2014 Hopscotch performance; if one were inclined to accuse him of being a “traditional” folk musician, or some kind of tribute act for Van Morrison and the classics, his recent performances throw those assumptions out the window. What Walker is attempting here is something entirely different, and something that’s a total stranger to the Civil War-wave garbage that passes for modern folk or “indie” music on most stages these days. That he has already attempted it on the biggest stages, such as at Pitchfork, further proves that Walker isn’t taking the easy, commercial way here. More power to him. After begging from the audience, the band closed with an even-newer tune, “The Great and Undecided,” a slightly more traditional number (so far) that we’re excited to hear develop. As Ryley enlightened us at the outset of this show, Tompkins Square has been delivering “sick nugs” for ten years now. I feel confident saying Ryley Walker will keep doing the same. He represents the best of the future, as well as the past. If you enjoyed this recording, PLEASE SUPPORT Ryley Walker, like him on Facebook, and buy All Kinds of You and The West Wind EP on Tompkins Square and Primrose Green from Dead Oceans. Also, check out Ryley’s new acoustic live album with Bill MacKay, which you can stream and buy here. Ryley Walker has been a can’t-miss for me on every single tour that has taken him through New York this year, the latest being this date at Le Poisson Rouge with Jessica Pratt. What is so remarkable about the five performances we have covered since September of last year is that every single one has been different, including the cast of performers. While Ryley’s a redoubtable solo artist, where he truly shines is in his ensemble, consisting of Chicago-based jazz artists who’ve played with Ryley on and off for years. On this night, he not only had the full compliment of his “regular” players, with Ryan Jewell on drums, Ben Boye on keys, Brian Sulpizio on electric guitar, and Anton Hatwich on bass, but also a horn section consisting of Levon Henry on sax and Jamie Branch on trumpet. The results were simply magical; over 41 minutes, Ryley and the players turned these three songs into long-form jazz meditations. If Ryley’s albums fall firmly enough into the “folk” camp, his live show is a completely different beast, something that lives as close musically to the Grateful Dead and free jazz as to Van Morrison or Bob Dylan. The brand-new song “Sullen Mind,” lyrically, is a hangover tune, a drunk’s lament, and Ryley summons the narrator’s loneliness and pain with relatively few lyrics, delivered at times with a slur that leaps to a howl. The ensemble follows with urgency, their collective sound growing insistent and dark, almost an analog for the troubled mind of the story. Seated just a few feet from Ryley, it was chill-inducing to watch and hear the song unfold, as the players barely needed a nod from their leader to storm forward from the last chorus into a climactic outro. The brass didn’t show up until the new track “Funny Thing She Said,” but that song made an immediate impact on a song that made a perfect bookend to “Sullen Mind,” both of them chill-inducing laments. And lest the lone album track played — “Primrose Green” — get short shrift, it, too, soared on the one-two punch of Brian Sulpizio and Walker on guitars, a poppy-field tripper of a track that makes you want to find some of the substance name-dropped in the title. As Ryley and his band headed off to Solid Sound Festival, more touring upstate and elsewhere, and finally back home to Chicago for the Pitchfork Music Festival, they are firing on all cylinders, a live unit at or near the peak of their powers. At this point, in festival-land, they’re still playing early — don’t miss them. I recorded this set with a soundboard feed from the Le Poisson Rouge team, combined with Schoeps MK41V supercardiod microphones clamped to the soundboard booth and a split pair of DPA 4061 omnidirectional microphones on the stage. The sound quality is outstanding. Enjoy! Mary Halvorson is a multi-talented, multifaceted musician who represents the best of the New York scene, which is to say that she seems to be everywhere all at once. A survey of her recent shows includes everything from more sedate jazz gigs at Cornelia Street Cafe, appearances with Tim Berne at the avant-jazz club Roulette, a show in the band People at Death By Audio, and of course, her current performances as opening act for Buzz Osborne aka King Buzzo of the Melvins, currently promoting his new solo album (that recording soon). As the New Yorker put it more succinctly, “she’s in tons of bands”. While we have tried to feature many of the best-known current virtuoso guitarists on this site, this is a first appearance for Halvorson, a slight embarrassment to us given both her talent and how prolific she is. As this set at Bushwick’s The Wick demonstrated, she is a singular improviser who in a single set can cut across generations and genres. For this set, Halvorson chose to go the all-covers route, including songs by Ornette Coleman, Oliver Nelson, the bassist Chris Lightcap, and a host of other U.S. and international leading lights of jazz and guitar music. To their credit, Buzzo’s metal-minded audience understood what was going on, giving Halvorson her due. She deserves all that and more. I recorded this set with a simplistic onstage rig of two small Countryman omnidirectional microphones split two and a half feet apart. While there is some ambient noise evident at points, the sound quality is excellent. Enjoy! If you enjoyed this recording, PLEASE SUPPORT Mary Halvorson, visit her website, and buy records from her substantial discography, which isn’t available all in one place but can generally be purchased at Discogs. We are very honored and excited to present our second experimental jazz recording for the site, the duo of Ryan Sawyer and Darius Jones opening for William Tyler at Union Pool. To quote my friend John Cook, a man much better educated on the scene than me, “both [Jones and Sawyer] are relentlessly experimental and quite diverse, leaving almost no stylistic or contextual stone unturned.” Indeed, these two have a recorded output and music history as diverse as the very bill they found themselves on this night. Sawyer has played drums and otherwise collaborated across a range of genres, for artists as diverse as Boredoms, TV On the Radio, Rhys Chatham, Kid Millions, Gang Gang Dance, and Mekons, with current projects including Lonewolf & Cub and Oso Blanco, where he’s joined by local experimentalists C. Spencer Yeh, Colin Stetson and Nate Wooley). Alto saxophonist Jones is an accomplished improviser who has joined projects ranging from the traditional to the wildly experimental. He participates in Gerald Cleaver’s Black Host, which released a record on Northern Spy in 2013, and found Jones veering ever-so-slightly toward a rock vibe. He has also released a series of three albums on the Aum Fidelity label that explore many sides of the jazz spectrum. As a player of the alto sax, Jones is able to wreak an almost unparalleled intensity from the instrument, as was in evidence at this short-but-powerful all-improvisational performance. Jones and Sawyer collaborate periodically in addition to their other projects, making this set a welcome surprise. Clearly more than a few fans were in the know, as the club filled up the second the doors opened for this performance. What you will hear on this recording are three separate untitled improvisations that provide a good introduction to both players’ style. Though the pieces are abstract, Jones and Sawyer manage to establish a natural sense of flow and drive to them, suggesting that this is a pairing worth further repetition. We hope to continue featuring more performances of this kind in the future. This set was recorded with an excellent stereo soundboard feed by Robert, the Union Pool engineer, together with Schoeps MK41 microphones. The sound quality is outstanding. Enjoy! Please support the work of Ryan Sawyer and Darius Jones — visit them on the web (Ryan is here, Darius is here), buy their music (Darius’ albums can be bought here; Ryan’s solo effort One Day Your Heart Will Be Your Skin, is coming soon), and watch for their upcoming shows. Virtually all of the music we cover on this website, partly by design, but partly by inertia, falls somewhere along the spectrum of “rock” music. Even if that’s the case, that represents only a fraction of the music we listen to, or are interested in. New York remains a hotbed of activity for the still-vital jazz scene, and one of the easiest and most low-key ways to get some exposure to the scene right now is through The Palimpsestic Series, curated by Oscar Noriega at the Park Slope bar Barbès every Wednesday night. On the advice of a friend, I settled in on a recent night for an outstanding set by the Washington, D.C. virtuoso tenor saxophonist Brian Settles and most of his band Central Union (Jeremy Carlstedt, on drums and Jean Marie Collatin Faye, on percussion and bassist Corcoran Holt). Settles’ 2011 album, Secret Handshake, represents the first record for the accomplished Duke Ellington School of the Arts veteran as a bandleader, a role into which he fits admirably. This set featured two of those compositions, “Zui Quan” and “Soulnimsky”, a cover of John Coltrane’s “Reverend King”, and three new numbers. Some rock shows make me flat-out bored these days; watching Settles and his band up close in this setting was riveting. In this postage-stamp-sized room, it’s not hard to arrive early enough to get a front-row seat to the action, and I would encourage live jazz newbies (like me) to take advantage of a chance to not only listen to the players, but watch how they interact with each other and the piece of music. Especially as live music is concerned, jazz (especially of the more avant-garde variety) is an undeservedly obscure art form. There is a whole world of exceptional performances out there – like this one – if you take the time to seek them out. Settles will next appear in New York on this Saturday, Feb 2., when he and Carlstedt appear as a duo as part of the Evolving Music Series, located at 107 Suffolk Street in Manhattan. Their set time is 10:30pm, and you can get tickets at the door. I recorded this set directly in front of the band using the mid-side technique with a Schoeps MK5 cardiod microphone as the center channel and a Schoeps MK8 figure-8 microphone as the “side”, which allows the recordist to vary the width of the stereo image. This recording provides exceptional width and clarity, though the instruments may be too localized for some people’s taste if they listen through headphones. Enjoy! If you enjoyed this recording, PLEASE SUPPORT Brian Settles, visit his website, and buy Secret Handshake from Amazon or your favorite retailer. With its all-star lineup of sacred steel/modern jazz/blues musicians, you can’t help but call The Word a supergroup. Featuring Robert Randolph (pedal steel guitar), John Medeski (keyboards), and all three members of North Mississippi Allstars – Luther Dickinson (electric guitar), Cody Dickinson (drums, washboard), and Chris Chew (bass guitar), The Word don’t generally get to tour together often (although they’ve done some festival dates this summer), but when these players share a stage, it’s an event. This year’s Mountain Jam was one such moment, as the players gave us 75 minutes of classic religiously-themed pedal steel compositions, including many from their sole album, 2001’sThe Word. The combination of the lovingly rendered compositions served up by these hypertalented musicians against the backdrop of the Catskills could fairly be called a religious experience of its own. I recorded this set with AKG 414 large diaphragm mics set to wide cardiod mode. The excellent house mix for this set, coupled with some post-processing, makes this my favorite of my Mountain Jam recordings (you can also download Ben Folds Five, Gov’t Mule and Givers). If you enjoyed this recording, please support these musicians by supporting and visiting the websites of Robert Randolph, The North Mississippi Allstars, and Medeski, Martin & Wood. 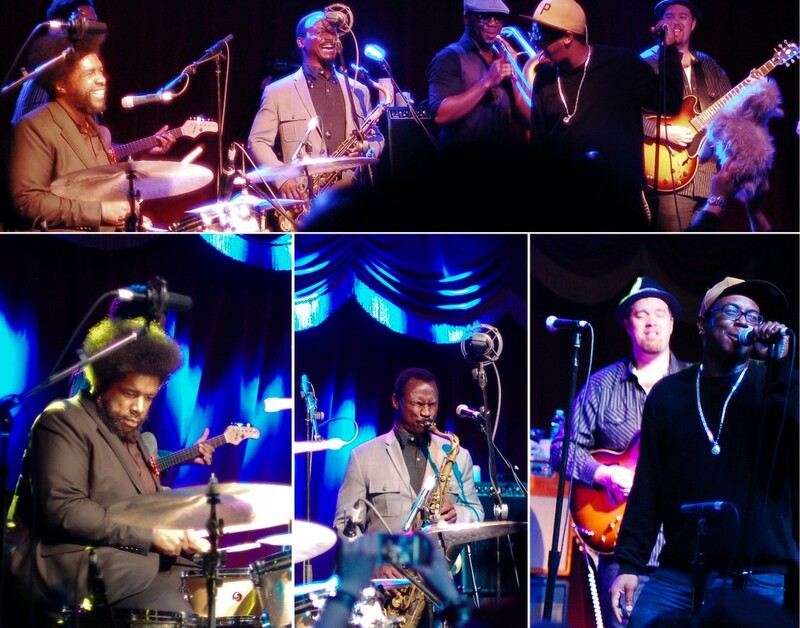 For the past two years now, the funk/jazz trio Soulive have been commandeering the cavernous adult playland Brooklyn Bowl for a series of concerts they dub “Bowlive”. These special shows in their home state of New York (they are originally based in Woodstock) feature memorable performances by the band as well as hordes of special guests; if anything, this year’s “Bowlive II” was even more epic than last year’s outing. This final night of their 10-day run promised to be a special one, and despite the last-minute illness-induced withdrawal of special guest Matisyahu, the band and their guests didn’t let that slow them down as they brought the funk for more than two hours. The tighter first set focused mostly on Soulive’s own material, including a heady rendition of “Doing the 2” jamming into “Too Much”, with the night’s opening act, Nigel Hall, on vocals together with Alicia Chakour. The first set closed with the night’s first surprise, when during their cover of the Meters’ “Just Kissed My Baby”, American Idol winner Taylor Hicks (remember him?) bounded to the stage. Adding backing vocals and harmonica to Hall and Chakour’s vocals, Hicks proved that although he may not be the most commercially successful Idol graduate, he lacks nothing in the talent department. Set two saw more musical exploration, including a special showcase for the talents of guitarist Eric Krasno on a cover of Stevie Ray Vaughan‘s “Lenny”. Not to be outdone, drummer Alan Evans brought the full force of his kit skills to bear during the night’s most epic number, “One in Seven,” featuring an extended solo in the middle. The set wrapped up with three covers: “Everybody Wants to Rule the World” by Tears for Fears (turned into straight-up soul number), Aretha Franklin‘s “Rock Steady,” and finally (and appropriately), the encore, “Makin’ My Way Back Home” by Lettuce (only half a cover, given the overlapping players in both acts). Bowling and funk may be natural bedfellows, or they may not be, but either way, we hope there is a Bowlive III in the future. We recorded this set with a combination of the DPA microphones at close range to capture the PA output, plus AKG large-diaphragm microphones onstage to capture the instrumental detail and broad, spacious stage sound. The results are truly outstanding. Enjoy! Special thanks to Soulive and Morgan Young for approving this recording, and to Peter Costello and the Brooklyn Bowl team for their hospitality and hard work.